Four questions determine whether a company is using interorganizational cost management. Does your firm set specific cost-reduction objectives for its suppliers? Does your firm help its customers and/or suppliers find ways to achieve their cost-education objectives? Does your firm take into account the profitability of its suppliers when negotiating component pricing with them? Is your firm continuously making its buyer-supplier interfaces more efficient? If the answer to any of these questions is ""no"", your firm risks introducing products that cost too much or are not competitive. The full potential of the supply network can be realized only when the entire supply chain adopts interorganizational cost management practices. Competitive pressure has led many firms to try to increase the efficiency of supplier firms through interorganizational cost management systems, a structured approach to coordinating the activities of firms in a supplier network to reduce the total costs in the network. Lean enterprises typically outsource more of the added value of their products than their mass producer counterparts. Lean enterprises usually compete more aggressively and must manage costs more effectively. Interorganizational cost management can reduce costs in three ways: through product design, through product manufacture and through cooperative approaches between buyers and suppliers to build smoother interfaces. However, more than just cost management must cross interorganizational boundaries. Suppliers are also a major source of innovation for lean enterprises. Successful supplier networks encourage every firm in the network to innovate and compete more aggressively. 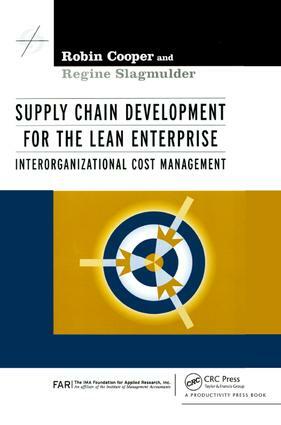 Read this book to learn to manage the supply chain to forge competitive advantage while reducing costs.